Hallo zusammen (aka hello everybody), it has been a hot minute since I've done a product review. But I like to test the product over a longer period of time before I pass a sentence. Over the last months, I put the Generation A Facial Serum a Vitamin C Serum from Generation Skincare to the test. Besides Vitamin C it also contains Hyaluronic Acid, Vitamin B, E, Green Tea and Aloe Vera. According to the product claims this is a fortifying, soothing and hydrating serum which is a lightweight, pre-moisturiser treatment that helps prevent the signs of ageing. So far so good. Before I start my review, I want to give you a quick overview of the ingredients and their impact on the skin. There are many forms of Vitamin C that are great for skincare uses. By far the most efficient form of Vitamin C is the Ascorbic acid or L-ascorbic acid. Ascorbic acid can create a younger looking skin by evening out the skin tone and re-ducing dark spots. It also protects the skin from harmful free radi-cals and promotes collagen pro-duction. This acid is a natural component of our skin. Its job is to attract and hold on to moisture to make the skin look plump, smooth and firm. Unfortunately, the Hya-luronic Acid level of our skin begins to increase at the age of 25. So in order to keep the skin looking plump and smooth addi-tional Hyaluronic Acid through skincare is almost mandatory. This vitamin comes in different classes from Vitamin B1-B12. But generally speaking Vitamin B boosts the skin elasticity, can re-duce skin irritations as well as redness and it improves the longevity of skin cells. Vitamin E is an antioxidant. Therefore it protects your skin from free radicals as well as removing them to prevent oxi-dative damage to your skin cells (aka skin ageing). It also is a great moisturiser. Green Tea is another great ingre-dient to fight signs of ageing. It contains Vitamin B and E. It also works as in antioxidant, can re-duce puffiness as well as redness and it clears clogged pores. Aloe Vera contains Vitamin C, E and beta carotene which make the skin firmer. Aloe Vera is also a great moisturiser and soothes the skin. Now that you are aware of the ingredients and the impact on our skin, it is time for my review. 1. This serum is packed with ingredients. There are no cheap "fillers" that do nothing for your skin in this serum. When you look at the ingredients list the first ingredient on the list is prevalent in the product. In this case, it is water. This means this serum is water-based. Therefore, it suitable for every skin type. But what makes the serum standout from other ones are the ingredients following the water. The first one is Vitamin C, in its best form Ascorbic acid. After that, the other key ingredients mentioned above follow accompanied by other great ingredients like panthenol, rose-hip and seed oil. There are serums on the market where the key ingredients are ranked on the last places of the ingredients list. Resulting in doing very little for your skin. With the Vitamin C Serum from Generation Skincare, you get something that is packed with beneficial ingredients, which can improve your skin and has never been tested on animals. 2. 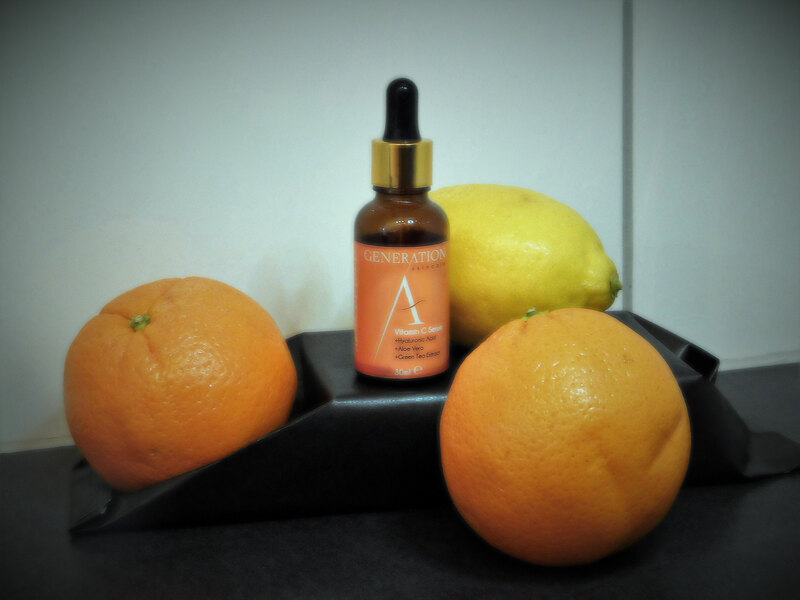 The serum has an orange scent to it which smells natural and hasn't bothered me at all. 3. Due to the high concentration of Vitamin C, you might feel a tingling sensation the first times you use it. This is not a bad sign, it is a good sign. It means the serum contains so many good ingredients that you can feel them working on your skin. Even I felt this tingling sensation although I have used other Vitamin C serums before. 4. I also use this serum as a primer before I apply my makeup because it really plumps my skin and my makeup looks great afterwards. 5. Did I see results? Yes! Right after the first application, my skin felt plumped and moisturised. After two-three weeks my skin tone was evener. I now use it for almost three months and my overall skin condition has improved and looks more hydrated. For me, this is for sure a repurchase product. P.S. : By using Vitamin C over a longer period your skin will improve further.